The Minnesota legislature is on ‘spring break’ this week following two intense weeks of committee hearings. Last Thursday (March 29) was the second committee deadline – so unless a bill has made it through all necessary committees, it will meet one of three fates: dead for the year, receive a special exemption from deadlines (very rare), or be included in an omnibus finance bill. Below is a quick update on several of the bills Medical Alley Association is tracking this year. If a bill you are interested in is not discussed, please let our Government Relations team know and they will get you an update. Summary: The Angel Investment Tax Credit provides qualified investors in certified small businesses with a refundable income tax credit equal to 25 percent of their investments up to a maximum of $125,000 ($250,000 for married joint filers). There is currently no funding for tax credits through this program. These bills fund this program beginning for tax year 2018 – while the amount of available tax credits differs in the bills ($20 million/annually in HF89; $5 million/annually in SF1668). Each bill also removes the sunset on the program, eliminating the need to reauthorize the tax credits. Current Status: The Angel Investment Tax Credit was heard in the House Tax committee last year and Senate Tax Committee on March 29, 2018—receiving overwhelming support. The bill was laid over for possible inclusion in the Senate omnibus tax bill. What’s Next: HF89/SF1668 were included in both the House and Senate Tax bills last year but fell out in conference committee. This year, Governor Dayton included funding for the Angel Tax Investment Credit in his supplemental budget proposal ($10 million for 2019 only). When meeting with legislators we have heard little opposition to the program and are working hard to get funding included in each chamber’s tax bill again this year. These bills are expected to be released shortly after the legislative recess concludes, so look for an update soon. Summary: This bill establishes the Opioid Addiction Prevention and Treatment Advisory Council. This council will review state opioid policy and make recommendations to the commissioner of human services on the provision of grants and funding to address opioid addiction. The bill also establishes the opioid addiction prevention and treatment account as a special revenue fund. This special account is funded through a new tax on opioids. There are significant differences between the House and Senate bills that are touched on below. Current Status: SF730 contains the new tax on every opioid pill sold in Minnesota and a new registration fee & surcharge on opioid manufacturers. HF1440 originally featured this tax as well, but it was removed from the bill in committee. SF730 was heard in the Senate Finance committee on March 28th. There was no public testimony, as public testimony was taken in earlier hearings. Senator Rosen walked through the fiscal impacts of the amendment and members offered comments. While there is bipartisan support for the bill, the senators do not believe that the State should have to cover the cost of the epidemic. HF1440 also originally established put a tax on opioids as well. With no foreseeable agreement on this issue in the House, however, Rep. Baker turned to other options – primarily the state general fund – to help fund the bill’s proposals for addressing the epidemic. Rep. Baker also added an amendment regarding the Prescription Monitoring Program (PMP). This assures no new requirements or procedures are set in place for those who currently have access to the database. It does not require a prescriber to access the database prior to issuing a prescription for a controlled substance. This raised concern with some who believe that prescribers should be mandated to look in order to get a handle on the epidemic, which some believe is partially due to overprescribing. What’s Next: SF730 was laid on the table in the Senate Finance committee. Sen. Rosen said discussions need to take place between her and PhRMA before moving forward on this bill in the Senate. HF1440 was referred to the Health and Human Services Finance Committee, where it will be heard on Tuesday, April 10. The bill could either receive a deadline waiver to move forward on its own, or be laid over for possible inclusion in an omnibus budget bill. Summary: The bill creates a council to get information to families who have a member with a rare disease about available treatment, coverages, and information generally about the disease. Most voting members are appointed by the Board of Regents with four members of the legislature making up the remainder. Ex officio members include the commissioner of health, a representative of the Mayo Medical School, and a representative of the University of Minnesota Medical School. Current Status: The bill was heard in both the House and Senate last week with wide bipartisan support. A delete everything amendment was adopted which refines how the council will work. The amendment gives the U of M oversight of the council, as they have the resources and ability to administer the council. Creation of this council will help bridge the gap in knowledge of doctors for rare diseases. The University of Minnesota has the opportunity to lead the country and world in finding treatments and cures for rare diseases. What’s Next: The House heard the Rare Disease bill in Health and Human Services Reform, Government Operations, and Higher Ed and Career Readiness Policy and Finance committee. The bill was referred to the committee on Health and Human Services Finance committee and is scheduled to be heard on Tuesday, April 10th, where it will likely be laid over for possible inclusion in an omnibus budget bill. The Senate companion, SF2786, was heard in the Health and Human Services Finance and Policy committee as well as State Government Finance and Policy and Elections on March 29th. The bill was referred to the committee on Higher Education. If passed, it will likely be sent back to the Health and Human Services Finance and Policy committee. From there its best past forward is being included in an omnibus budget bill. Summary: Provides that a contract between an employer-sponsored health plan or health plan company, or its pharmacy benefit manager, and a licensed pharmacy, may not prohibit a pharmacist from informing a patient when the amount the patient would pay for a particular drug under the patient’s health plan is greater than the amount the patient would pay out-of-pocket at the pharmacy’s usual and customary price. Current Status: This bill has bipartisan support in the House and Senate. What’s Next: The House heard the bill in the Health and Human Services Finance Committee on March 28th, and sent it to the General Register. In the Senate, the bill was laid over and may become part of an omnibus budget bill. Summary: Step therapy is a policy requiring a patient to try and fail first on several medications before receiving their doctor-prescribed medication. This bill improves the one size fits all approach. It creates a waiver process to override the step therapy protocol if the provider believes patient needs access to a specific medication. Current Status: The bills were heard both in the House and Senate last week to meet the second committee deadline. Throughout the committee process considerable time was spent between authors and stakeholders to address concerns with the bill. These efforts helped obtain bi-partisan support in both bodies. What’s Next: The Senate companion was passed out of Health and Human Services Finance Committee on March 27th and sent to the Finance committee where it awaits a hearing. The House State Government Finance committee passed the bill Thursday Night, March 29th, 2018 and referred it to the Health and Human Services Finance committee. Unless it receives a deadline waiver in the House, this bill will have to be part of an omnibus budget bill to get completed this year. HF3312 (Zerwas)/SF2975 (Pratt): Modifies patient consent for the release of health records under the Minnesota Health Records Act. Summary: This bill modifies patient consent requirements under the Minnesota Health Records Act for the release of health records. It would align Minnesota’s procedures with what is currently required under HIPAA. Current Status: This bill was heard in the House Health and Human Services Reform committee on March 5, 2018 where it was passed to the Civil Law and Data Practices committee. It did not receive a hearing in this committee before deadline. The Senate companion did not receive a hearing in the Senate. What’s Next: Without a deadline waiver in each body, this bill cannot move forward this year, unless it is included as part of an omnibus budget bill. Summary: This bill establishes a Minnesota Health Policy Commission to develop recommendations for steps to take to improve health care and health outcomes at lower cost. This Commission would be comprised of independent experts in health care finance, health economics, actuarial science, health plan management and finance, health care system management, purchaser and an expert in development and utilization of innovative medical technologies, a health care consumer advocate, a primary care physician, a long term care provider and someone with direct experience as an enrollee, or a parent or caregiver of an enrollee in MinnesotaCare or medical assistance. 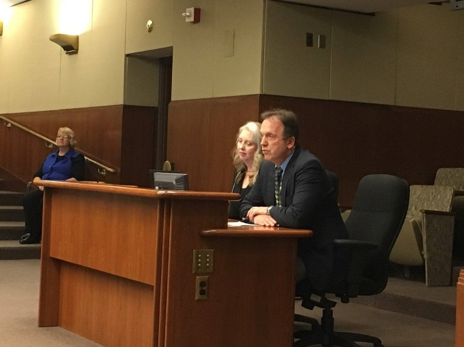 Current Status: Advocates support the establishment of the Commission because data shows Minnesota has some of the highest commercial health care costs in the country, and this Commission will help find ways to reduce those. Those who have addressed concerns with the bill believe someone with a background in Mental Health should be appointed to the commission, and that the commission is heavily skewed towards the industry and less on the patients. Others have pointed out that several items in the bill are being addressed by agencies and non-partisan staff. The bill authors have been receptive to the concerns raised by advocates, those with concerns, and members of the legislature. They continue to work with all involved to modify the bill so it can continue to move forward. The companion bill in the Senate was heard in State Government Finance and Policy and Elections and Health and Human Services Finance and Policy committee. It was referred to the Judiciary and Public Safety Finance and Policy committee where it awaits a hearing. This bill will either be laid over for possible inclusion in an omnibus budget bill or referred back to the Health and Human Services Finance and Policy committee, where it also likely be laid over for possible inclusion in an omnibus budget bill. Summary: This bill proposes a constitutional amendment allocating state general sales tax revenue related to motor vehicle repair and replacement parts exclusively to fund roads. This amendment would be on the ballot in 2018 for voter approval. Current Status: The bill was heard in the Senate Transportation Finance and Policy Committee on March 28th. There were several testifiers—those supportive of the bill believe we need to dedicate stable funding to take care of our infrastructure and jobs. Those opposed believe the constitutional amendment would put roads and bridges over health care and trade unions over education. Establishes a new road and bridge fund that will consist of the tax proceeds from sales taxes on motor vehicle and trailer repair and replacement parts and rental vehicles. Establishes a new Trunk highway construction fund that is to be used only for road and bridge construction and repair projects and repayment of bonds. Constitutionally dedicates the motor vehicle lease sales tax revenue, which is currently statutorily dedicated. These tax proceeds are distributed to the county state-aid highway fund; the greater Minnesota transit account; and for local bridges. Requires the constitutional amendment to be placed on the 2018 general election ballot. What’s Next: The bill passed on a party line vote and was referred to the Rules committee. There is no companion in the House. If a bill is introduced, and given a hearing the Transportation Finance Committee. To advance any further it would need to receive a deadline waiver and also pass the Rules committee before advancing to the General Register. There are only six weeks remaining in the 2018 Minnesota Legislative Session – but there is quite a bit of work still on the docket. This work includes negotiating and passing bills to conform Minnesota’s tax code to changes at the federal level, a capital investment bill that would bond for millions of dollars in new public projects and a supplemental budget bill. The legislature likely will also pass legislation addressing the opioid epidemic in Minnesota, improving school safety, and more solutions for the troubled MNLARS system. The upcoming 2018 elections continue to be at the forefront of everyone’s mind at the Capitol. Election considerations have a heavy influence on almost every major policy decision being made. The entire House of Representatives is up for re-election (currently controlled by Republicans 77-57), as is the Governor’s office. Neither Republicans nor Democrats know who their candidate will be – but both parties will use the last few weeks of the legislative session to lay out their overall message to voters. Further, since Governor Dayton is not on the ballot this fall, election considerations are not as important to him as in the past. This could result in additional deal-making with Republican legislators – or in the Governor taking a harder stance against proposals he does not agree with. Governor Dayton has said on several occasions that he wants to leave the state on solid financial footing, so look for this to play a major factor in negotiations down the stretch. Our Government Relations team is on the ground every day at the Minnesota State Capitol, tracking and advocating for issues important to Medical Alley Association’s members. Look for more updates and inside information about the conclusion to the legislative session in coming weeks. On Wednesday, March 28, the Senate Taxes committee held a hearing on SF1668. This bill, authored by Senator Paul Anderson, would make the Angel Investment Tax Credit permanent and fund it at $5 million annually. 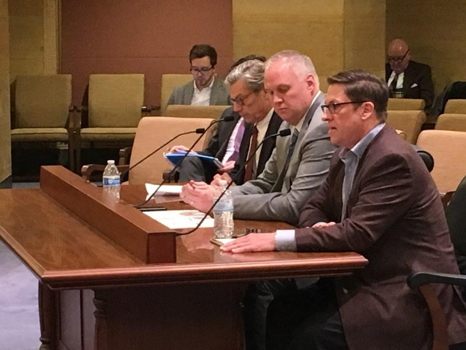 Two Medical Alley Association members were there to testify in support of the legislation – Paul Hines from DOSE Health and Michael Lacey from Prevent Biometrics. Each of them testified how the Angel Investment Tax Credit helped attract investors early on, enabling each company to grow and draw additional investment. The committee members were supportive and the bill was laid over for possible inclusion in an omnibus tax bill.  Medical Alley’s success is about the success of our members. Legislators need to hear from you. Please share your stories, successes and challenges with us. If you are interested in taking an active role in our efforts, meeting with legislators or testifying on issues, please let us know. Our Government Relations team will do all the work! 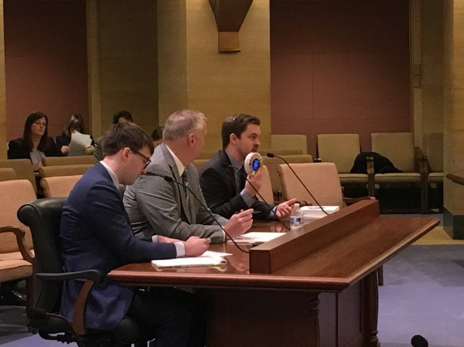 The House Agriculture Finance committee met on Thursday, March 29, to hear about Minnesota’s preparedness for foreign animal diseases outbreaks. Medical Alley Association member Recombinetics testified about how their gene editing technology can be used to help prevent certain future disease outbreaks. Thanks to Mitch Abrahamsen, Chief Commercial & Scientific Officer, at Recombinetics for coming and sharing the great work being done by an innovative Minnesota company.